In light of the subsequent history of Iraq, it seems almost unthinkable that 30 years ago Britain sold millions of pounds of military equipment to the country's Baathist government. Foreign Office papers, just released by the National Archives in London, show that defence sales to Iraq in 1976 amounted to an estimated £70m. 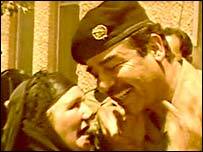 At this time, Saddam Hussein was the de facto leader of Iraq - taking on a more prominent role than the ageing president, Gen Ahmad Hassan al-Bakr - before formally taking power in 1979. The documents show that, in 1976 and 1977, a variety of equipment was sold to Iraq, including 20 Cymbeline mortar-locating radar - at a cost of £11m - combat support boats, and £7.4m of weapons effects simulators. Big contracts for Dennis fire fighting-vehicles and fuel tankers were also secured. Iraq also paid Britain £500,000 to train Iraqi pilots. The papers also suggest that, in 1977, six Iraqi soldiers were trained at Sandhurst, where Princes William and Harry subsequently underwent their military training. "Steady sales" of "a wide range of smaller items" were also recorded including billiard tables. The regime also purchased army shirts to the value of £830,000, meaning that the Iraqi army were wearing uniforms made in the UK. 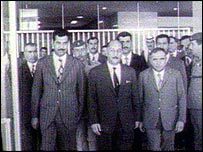 But such apparent free-flowing exports to Iraq do not mean that Britain did not have grave doubts about the government of the Baath Party, which had taken power in 1963. A letter to the UK government - dated 14 February 1977 - from Archie Lamb, the British ambassador in neighbouring Kuwait, notes that "the Kuwaitis regard the present regime in Baghdad as nasty and brutish". "Not an opinion from which I imagine many of us would dissent," Mr Lamb's letter adds. He notes that it appears "that Saddam is pretty firmly in the saddle but even Saddam is not immune to the assassin's bomb or bullet and would the regime survive without him"? In reply, an I McCluney, of the government's Middle East department, displays a spectacular inability to predict Saddam Hussein's subsequent reign of terror. He writes: "The most likely development in Baghdad is a continuance of Baath socialist government even, I submit, without Saddam Hussein - who is in any case, I believe, one of its more respectable figures." He adds: "In time, as the country develops, the Baath may mellow and become less repressive." The reservations of James Callaghan's Labour government about its Iraqi counterparts had led to a Memorandum of Understanding being signed between the two countries in March 1976 restricting the types of weapons that could be sold to Iraq. A document produced by the government's Middle East department explained that "the sale of UK defence equipment to Iraq is constrained by the need to consider the likely effect this will have on the strategic balance in the Middle East". If Britain sold "sophisticated weapons" to the pro-Palestine Iraqi government, it would be resented by Israel as well as by neighbouring Kuwait and Iran, the document continues. This would "jeopardise our far greater defence sales" to those regions, it adds. It refers to a "shopping list" of equipment which Britain would be prepared to sell to Iraq. The note adds that the list "excluded items which, for security reasons, we would not wish revealed to the Soviet Union via the close Iraqi/Soviet military connection". Excluded items included tanks and aircraft including fighter planes and helicopters. But in April 1976 - a month after the Memorandum of Understanding was signed - a note from the British foreign and defence secretaries seems to contradict the idea of restricting the supply of defence equipment to Iraq. Their memo to other ministers reads: "The confidence engendered by a more comprehensive supply of defence equipment is likely to have a favourable effect upon general commercial relations between the two countries." Their note continues with a statement sure to interest critics of the current conflict who suggest that the UK and US intervention was motivated by oil in Iraq. "We could lose the goodwill we have been slowly and painfully trying to build up since the resumption of diplomatic relations aimed at gaining access to large projects and the Iraqis' huge oil wealth." It adds: "In light of the above considerations, it is recommended that we should tell the Iraqis that we would be prepared to supply the optical version of Rapier [surface-to-air missile], the Scorpion family of armoured vehicles and the 105mm Light Gun."